Spring flowering bulbs, including Tulips, Crocus and Daffodils can be planted any time between September and December. The proper time to plant is when the soil temperature is below 13C (55F) at the bulbs planting depth and by September soil temperatures have usually stabilised to this. The main point is you need to plant in the autumn for them to flower for spring. Even if planted late, bulbs will spring into action and try to start root growth. They are pre-programmed to grow and will do their best no matter how late you plant them. What if I can't plant my bulbs immediately? If you are unable to plant straight away then they will keep for several weeks as long as the bulbs are unpacked and kept where good air circulation can be provided. A cool garage or garden shed would be the ideal place to store any unplanted bulbs. Remember to keep the packaging by them or label them as its easy to forget whats what if you buy a few different sorts. What is the best planting method? There are many easy ways to plant bulbs depending on the type of bulb and the effects you are looking for. Use a trowel or a bulb planter for planting individually or in small groups. Bulb planters can be bought from most garden centres. The handles from broken garden forks and spades can be kept and transformed into ideal bulb dibbers. Mass or 'carpet' planting can be achieved by digging trenches. Smaller bulbs such as crocus or snowdrops can be planted by simply lifting the turf and resting in position and then laying back the turf over the scattered bulbs. Should I plant in clusters? Group planting of bulbs make a nicer show than individual planting. To create greater colour impact in the garden, plant clusters of the same-colour flowers in blocks or "bouquets". One trick worth trying is to position similar bulbs in a triangular planting scheme, with the point of the triangle towards the front and the long leg towards the back. The result, will look as if you have planted more than you did! 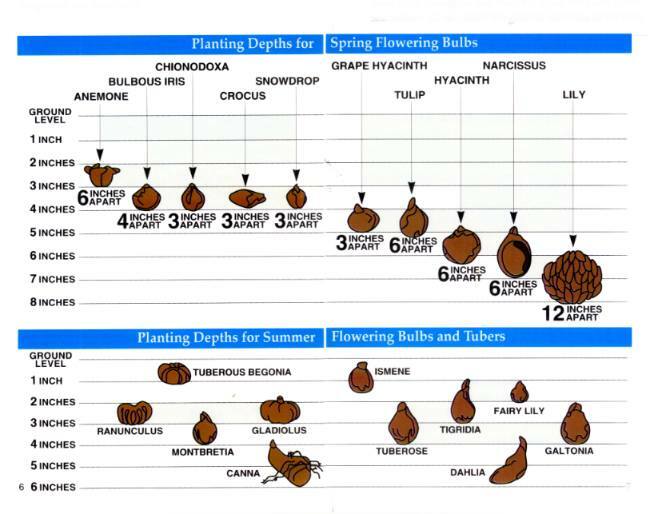 There is no exact science to planting bulbs. A general rule of thumb that applies to most bulbs is to plant at least 2-3 times the depth of the bulb and remember the roots should be facing downwards. The distance between the bulbs depends on the size of flower, but they need to be far enough apart to not be touching each other. Natural effects can be achieved by planting in drifts. Refer to guide above to give enough room for the bulbs to naturalise. Will the bulbs need to be fed to encourage flowering? No, a bulb holds all the food reserves it needs to come into flower. Any bulbs you wish to retain after flowering will then benefit from a dressing of bone meal or together with a slow acting fertilizer (Osmacote is very good). Do NOT remove or tie up the dying foliage as all the goodness will need to go back into the bulb. Is bone meal the best bulb food? Once upon a time, bone meal was considered an excellent bulb fertilizer, but times have changed! Most bone meal produced now has been so thoroughly processed that the essential nutrients have been literally boiled out. Spring flowering bulbs actually need no fertiliser for their first season of flowering. The commercial size bulbs which we supply will already contain all the food it needs to support one season of spectacular growth. Bulbs that are left in the ground to naturalise will benefit from a top dressing of chipped bark with slow release fertiliser added when the shoots first appear in spring and again the following autumn. Should I apply mulch, and how much and when? Mulch is not essential but is often beneficial. Two or three inches is plenty. Contrary to popular belief, mulching over bulbs is meant to retain moisture and keep ground temperatures stable, rather than providing a warm winter blanket. An added advantage is in spring, if you get heavy rain , it stops soil splashing over the blooms. Why have my Tulips not grown as well in their second year? Some gardeners treat Tulips as they would annuals and lift and dispose of them each year. If you wish to keep the bulbs in peak condition then mark and label where you plant and once the stems have died down, lift and store somewhere dry and airy. Discard the small or damaged bulbs and replant the larger ones in the autumn. This process will then reward you year on year. How do I protect my bulbs from rodents? I have found the most effective method is to create a wire mesh ball/sandwich around my bulbs and then plant in their own little 'safe' . The holes still allow the shoots to come through and the food store is safe from attack. I have seen the same variety of bulb priced very differently. Why the price difference? Bulbs are gauged by their calibre, or the measurement of the bulbs circumference. For each particular variety, the top grade bulbs which the growers /parks departments demand for guaranteed performance are the ones to source. These demand a slightly higher price, but its worth it for high profile planting where you want good quality blooms the first year after planting. The younger (smaller calibre) bulbs, which are often sold at lower prices, can offer a good way of adding colour to marginal areas of the garden where they can be left to naturalise and mature over time. Much confusion has existed over the proper name for these plants. Actually, both daffodil and narcissus are correct. Narcissus is the generic botanical name given to these plants in 1753. In England however, the plants were known as daffodils. This term was carried to other countries by English-speaking people. Narcissus, then , is the correct botanical name for the genus and daffodil is the correct common name for all members of the genus. Daffodils and Tulips have few insect and disease pests. Healthy bulbs planted in good locations will have few problems once established. Well drained soil and avoiding over-fertilization, especially with nitrogen rich feeds is the best advice. Daffodils are not difficult to force in the home. Begin the forcing process about October 1. Large bulbs will force best. Soaking the bulb for 24 hours in water before planting helps develop good root growth. Use a 6/8 inch pot with drainage. Use a well drained soil/compost and fill the pot to 2 inches from the top. Add the bulbs close together and fill the pot with soil/compost. About 5 bulbs may be planted in a 6 inch pot. The noses of the bulbs should be exposed. Water the plants thoroughly and fertiliser will not be needed. Place the pots outdoors and cover with soil/compost so the pots are covered about 6 inches. The pots may be taken indoors for forcing when they show good top growth and the flower bulbs are clearly visible. This usually takes 10 to 12 weeks. When the pots are first taken indoors, they should be kept cool where temperatures are around 10 to 13C (50 to 55 degrees F) for about two weeks. During the next few weeks they should have higher temperatures of around 16C (60 degrees F). By this time flowers should begin to open and they can be moved where desired. Keep the plants well watered. Not all varieties force well, but some that do are Abba, Avalanche, Beryl, Bridal Crown, Cantitrice, Carbineer, Carlton, Cragford, February Gold, Fortune, Geranium, King Alfred, Peeping Tom, Printal, Saint Keverne and Silver Chimes.